Well, this is neither the lemon souffle nor savory empanadas I had promised you… but seeing as these were so successful, they had to be shared. The dessert lends itself well to people with dietary restrictions, as it is filled with a rice- flour based custard, and the “dough” is simply smashed plantains! Who knew. I was pretty skeptical that smashed plantains would have enough structure to be a viable dough, but I was happily proven wrong! I may try to work with them as a tart dough next. Anyways, these are a little time consuming, but if you make a big batch you can freeze/refrigerate the remainder to bake or fry as you see fit. And, they are pretty easy on the wallet…. try and find a latin grocery/deli around you, because the cheapest platanos will normally be sold there. Look for ones that are black/ really spotty, because those are the sweetest and the least starchy. Last note- we fried and baked these, and we both preferred the baked ones, though I think they are better eaten the same day they are baked off. It took a little while, but if you bake them you also save yourself a lot of wasted oil. If you do fry them, use canola oil for its lower smoking point- olive oil will be a)too expensive b)smokey c) chemically broken down by the time it heats up, into some not-so-nice compounds. You could try broiling and let me know how it goes! Feel free to add a touch more sugar and/or dust with powdered sugar- I don’t like my desserts too sweet, so the variation below worked best for me. First, infuse your almond milk mixture. Bring it to a low simmer, then add the sugar and spices. Turn off the heat and let it sit. Bring a large pot of water to a high boil. 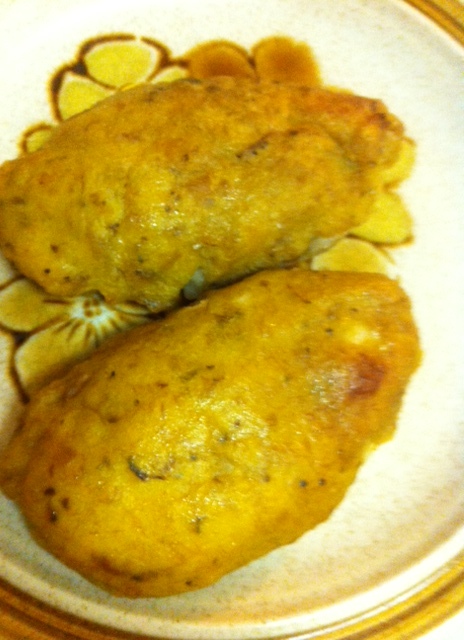 Cut off the ends of the plantains, then cut each into two pieces, leaving the skin on. Boil the plantains until the skin starts to come off- 30-35 minutes. Drain, then remove the skins using two forks- the plantains will be too hot to touch, but you should do this part quickly. 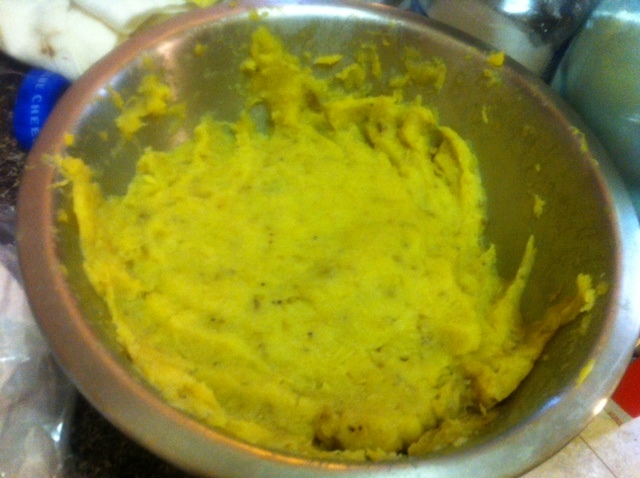 Place into a large bowl and mash them thoroughly, about 10 minutes. They will start to smooth out and become a thick paste/dough. 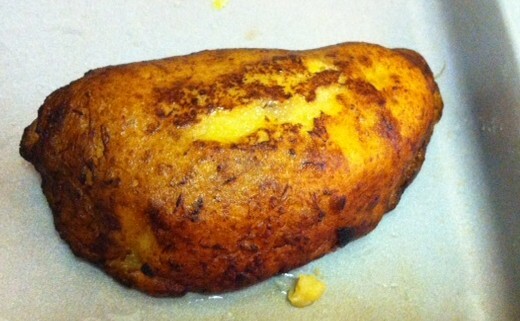 Let cool until you can touch them comfortably- it’s empanada time! Divide up the dough into ten equal(ish) portions, and pour a small portion of canola oil to dip your hands in. This will keep them smooth and easy to work with. Let rest. Pick out the cinnamon sticks and star anise from the manjar (custard) mixture, and bring back up to a simmer. Gradually add the rice flour and cook on low heat, whisking constantly, until it starts to thicken. Remove from heat, as it cools it will thicken further. Flatten each portion between your palms until as thin as possible without breaking, and then add about two tablespoons of the almond milk custard to the middle of the disk- I find its easiest to control if you do this while it’s in your palm, and not on a sheet tray. Fold over the top to seal the edges, and repeat until all the dough portions are finished. 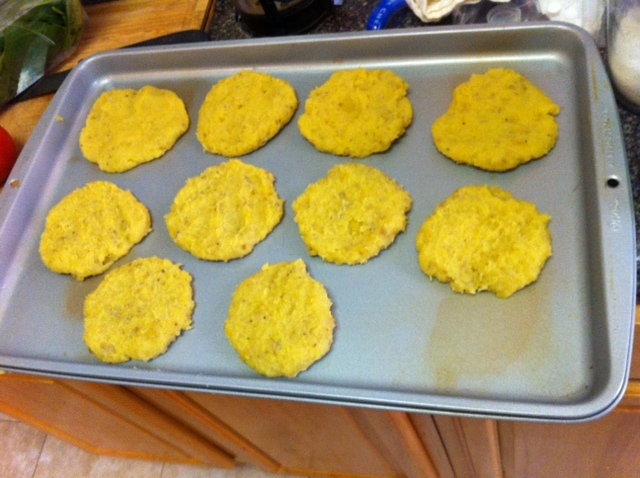 If baking, bake at 400 for about 35-40 minutes, until lightly golden brown. If frying, heat about 2 cups canola oil to 200 in a deep, very dry pot (it will spatter, so be CAREFUL!!!! NO water please) . Fry until deep golden, about 1 minute. Let cool slightly, top with powdered sugar if you want, and enjoy!